The Bros under the effect of Speed-Up. 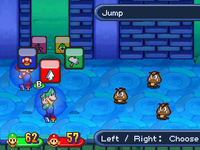 SPD-Up is a positive status effect experienced in Mario & Luigi: Partners in Time, Mario & Luigi: Bowser's Inside Story and Mario & Luigi: Paper Jam. It stands for "Speed-Up". In the former game, by ingesting a Blue Pepper, Mario or Luigi can increase their Speed, making it more likely that they will attack before their enemies. The effect is indicated by an expanding blue circle of aura around Mario or Luigi. In the latter game, only enemies can power themselves up with this condition. Rising blue streaks signal the power-up. Bowser and Paper Mario can also get this status condition, the latter getting it along with the bros using a SPD-Up Battle Card. This page was last edited on December 8, 2018, at 20:37.